If there's one game that doesn't quite fit into Far Cry's exotic zoo of flammable locales, it's Far Cry 3: Blood Dragon. The standalone spinoff (often confused for DLC) dragged the franchise's jungle-stalking into a neon cyber-parody of 1980s action, stripping off a serious face to reveal a toothy grin and bulging cheek. Players loved it, and some wondered why that couldn't have been THE Far Cry 3. As much as I like what I've played of THE Far Cry 4, I wonder about a full surrender to Shangri-La, the strange, mystical reflection of the game's "real" Himalayan world. These excursions into Shangri-La are absolutely integrated into the main storyline – not DLC – and spread across five unreal episodes. 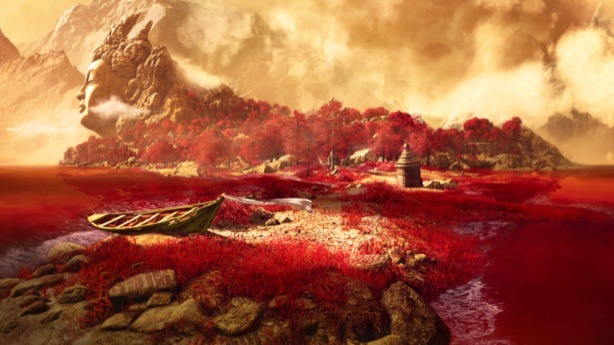 There may yet be another Blood Dragon, but Far Cry 4 comes with weirdness built-in. Injected by Ubisoft Toronto (lead developer on last year's Splinter Cell Blacklist), the Shangri-La levels fling you into a vivid imagining of a corrupted utopia, inspired by Hindu mythology. Instead of snow-encased mountains and heavily-guarded outposts, you find continents floating away, restrained by massive chains, and blood-red rivers crossing the paths of a demonic army. There's a serious visual commitment to the premise, which feels alien not just for Far Cry, but games in general. And though Shangri-La generally steers clear of overt religious material, Ubisoft hasn't sanitized it so much as to have ancient warriors converse in odd accents – all dialogue is in Hindi and subtitled. 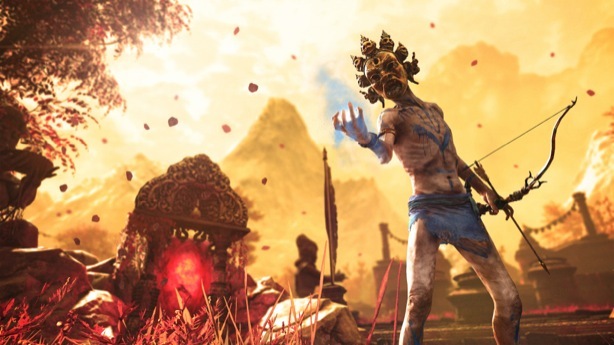 Far Cry 4's pattern of stalking, planning and executing (both the plan and its victims) is alive, yet primal in Shangri-La. As a warrior named Kalinag, you oust demons in the region with arrows and a sure aim. Pulling back on your magical bow slows time for a duration, giving you precision in balance with a small quiver. There are different arrow types as well, but real backup comes in the form of Shangri-La's protector: a beautiful, white spectral tiger that stalks the surreal landscape with you. Your cloaked predator is best set on some of the fiercer, stranger demons in Shangri-La. Fire-breathing beasts, for instance, keep you at a distance until your tiger takes a bite. Once they're distracted, a piercing thrust from your dagger destroys them, dispersing their remains into a bright blue powder. Much like the region itself, death in Shangri-La is saturated in color. The tiger isn't invincible, but it can return from death after you spend some time without it. Waiting in the ember-red grass for its return is a good idea when you're vastly outnumbered, since it can dispatch lesser enemies on its own while you work to complete your mission. Rather than capturing outposts in Shangri-La, you're unchaining massive iron bells – a ring from them reclaims a bit of Shangri-La and clears out demonic invaders. Meanwhile, back in Far Cry 4's other land of Kyrat, protagonist Ajay Ghale completes these violent recollections of a mystical place, gaining gameplay rewards and a bump in his strength of character. Each special tapestry he finds is a gateway from the Himalayas to Shangri-La, and another opportunity to root out its otherworldly invaders. Perhaps Kalinag is sitting in front of a game poster in Shangri-La, dreaming of loud weapons and a purple demon in the snow.